Many people are keen to know if the conservation actions they are taking are making a difference. For so many of us, our environmental projects are hardly noticeable in the ‘big picture.’ Unfortunately, we cannot measure all of the actions or projects that we, as a collective of individuals or community, might be undertaking. That is why it is very important to measure the practices and relate the environmental outcomes with our actions in smaller areas. 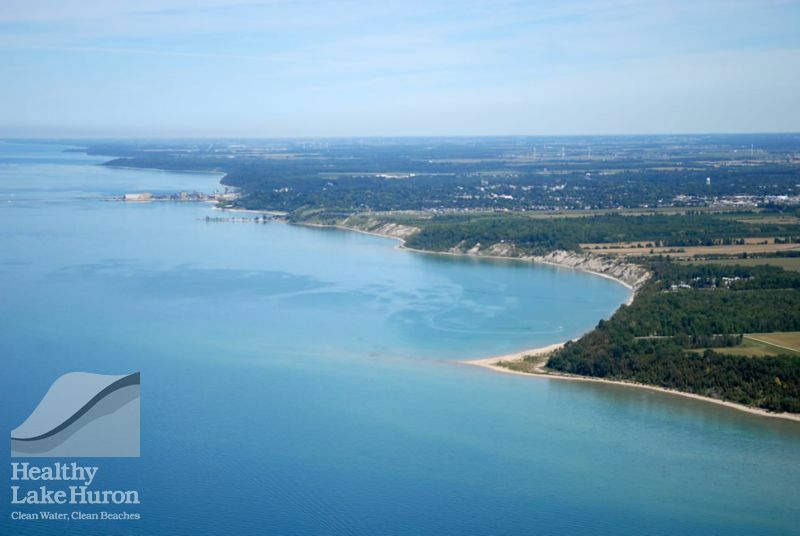 The Bayfield North Watersheds, a 40 km2 (square kilometre) area located along Lake Huron between Bayfield and Goderich, consists of approximately 20 small streams flowing directly into the lake. It extends 8 kilometres (km) inland from the lake, and is comprised mainly of agricultural land, with some natural environment, as well as recreational and settled areas along the lake. These watersheds and, in particular, Gully Creek, have provided farmers, watershed managers, and researchers with a “living laboratory” since 2008. It is here where we have examined the environmental efficacy and cost-benefit relationship of rural best management practices (BMPs). 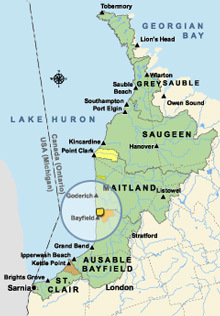 The Bayfield North Watersheds are has several Environmentally Significant Areas (ESAs) and one Area of Natural and Scientific Interest (ANSI) that boasts a provincially rare-to-uncommon vegetation type – the Silky Dogwood Mineral Thicket Swamp. In addition to natural area, one aquatic species at risk has been found in the Bayfield North Watersheds, specifically in Gully Creek. The Redside Dace, considered to be endangered in Ontario, prefers cool-water headwater streams and has been found in Gully Creek on several occasions. Furthermore, the area’s main land use is agriculture and there is a growing population of people wanting to live close to the natural areas, including Lake Huron. A first step was to develop a watershed plan that represented the needs of the community (2010). Since that time, a great deal of work has happened in the Bayfield North Watersheds. There have been many BMPs implemented by landowners and farmers within the Bayfield North Watersheds. Since 2011, when the Healthy Lake Huron initiative began, approximately 75 BMPs have been implemented in this area. Types of BMPs implemented include erosion control structures such as Water and Sediment Control Basins (WASCoBs) and grassed waterways, tillage reductions, precision nutrient application, cover crops, wetlands, fragile land retirement, and the installation of windbreaks along fields. Monitoring efforts have become more meaningful as we work with different partners at the Ontario Ministry of the Environment and Climate Change; the Ontario Ministry of Agriculture, Food and Rural Affairs; Environment and Climate Change Canada; the Ontario Soil and Crop Improvement Association; and the University of Guelph to evaluate the effectiveness of the BMPs. 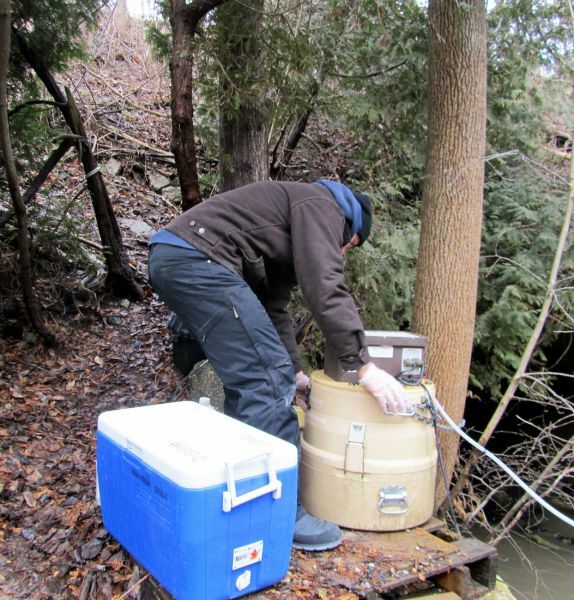 Monitoring at both the watershed scale and the field scale at several sites, during rain and snowmelt events, has enabled us to see initial reductions in phosphorus and suspended sediment as BMPs are employed. Landowner engagement has also been ongoing since 2011. A number of landowners are visited regularly to provide project updates, as well as gather updated farming information for modelling purposes. Additionally, some farmers and landowners have been engaged through topical workshops, such as two workshops regarding cover crops. Discussion and engagement with landowners has led to further BMP implementation as well as monitoring opportunities. Overall, the Healthy Lake Huron initiative has had a positive impact on the people and environment in the Bayfield North Watersheds, and this impact will be ongoing for many years to come.